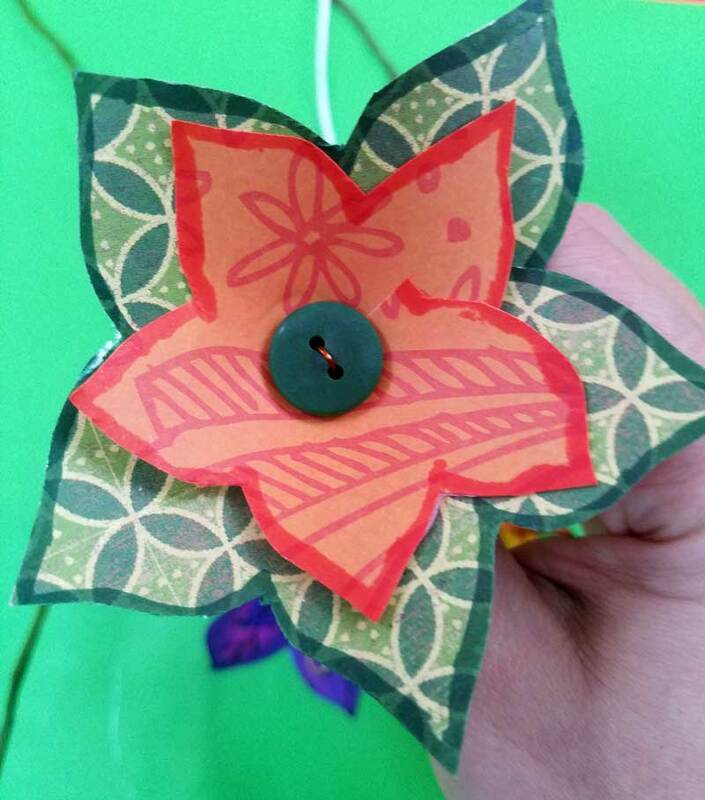 A while ago, I was playing with some scrapbook paper and buttons and came up with a simple yet adorable prototype for these paper flower templates. 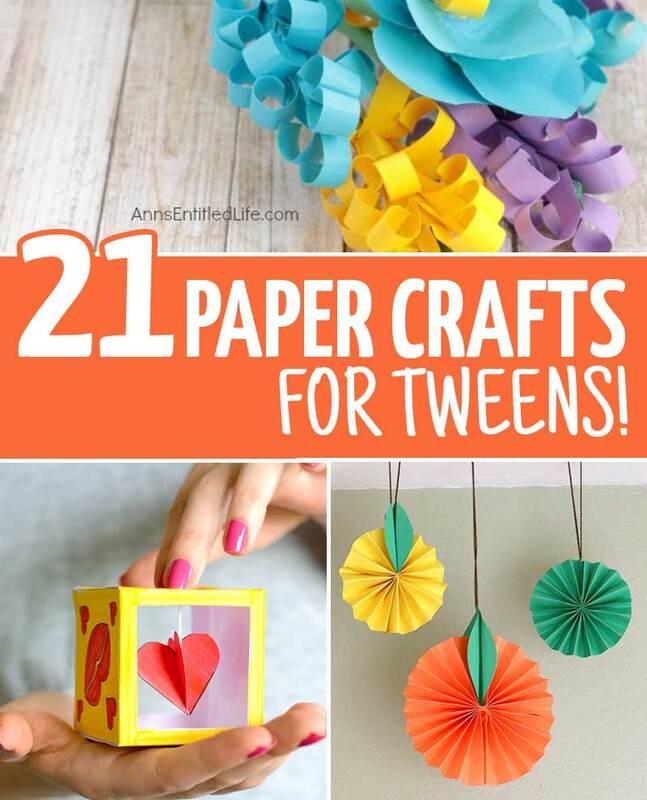 They are the perfect paper crafts for tweens or teens – or even grown-ups! 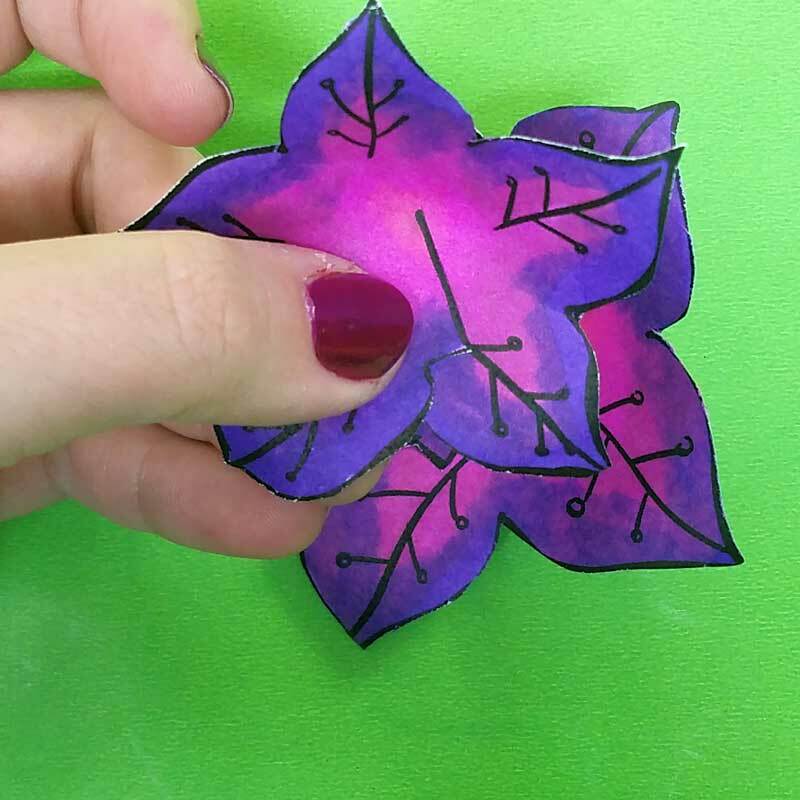 Both the process of using these paper flower templates and the use of the end result is open-ended as you’ll see in the options I shared here. Disclosure: this post contains commissioned links. I create lots of crafts. I mean LOTS of them. But I do share just about everything that comes out doable, nice looking, and that may provide the solution to your crafting needs (time-permitting, of course). That’s what happened with these adorable paper flower templates. It excites me so much that I violated my typical procedure for writing tutorials and started writing it before I finished processing the images. 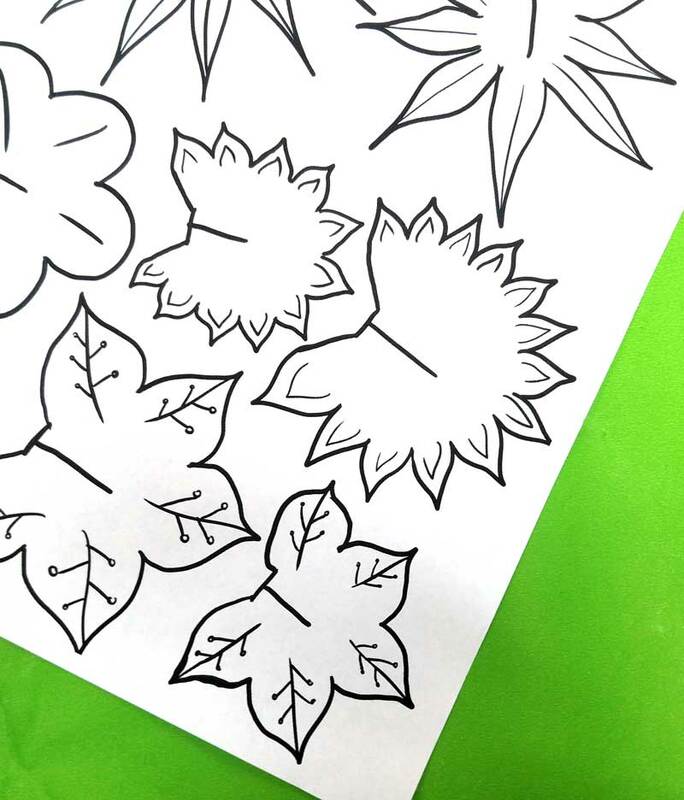 At first, I was planning on making these as a template to use with scrapbook paper (and you still can do it that way as you can see in the sample below). 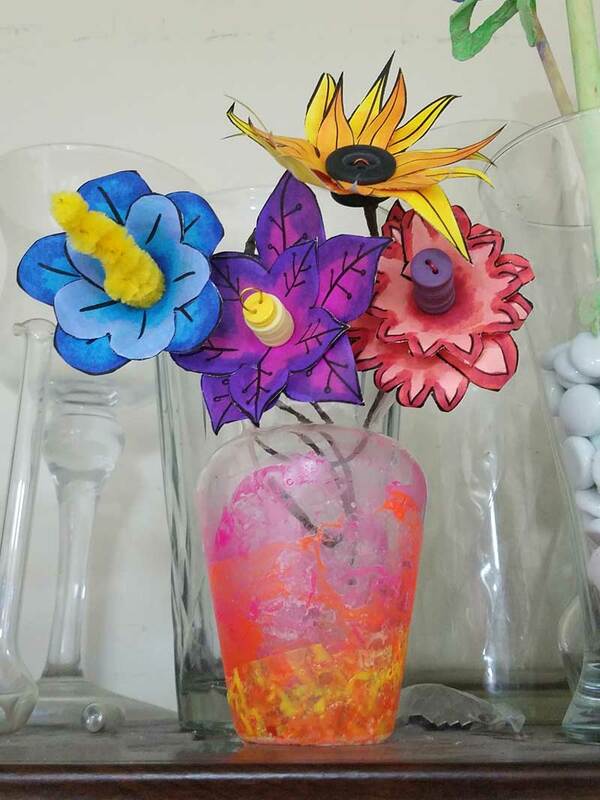 You can gather the finished craft you make with these paper flower templates into a vase (I shared how to make this vase here) for a simple and fun display or centerpiece. 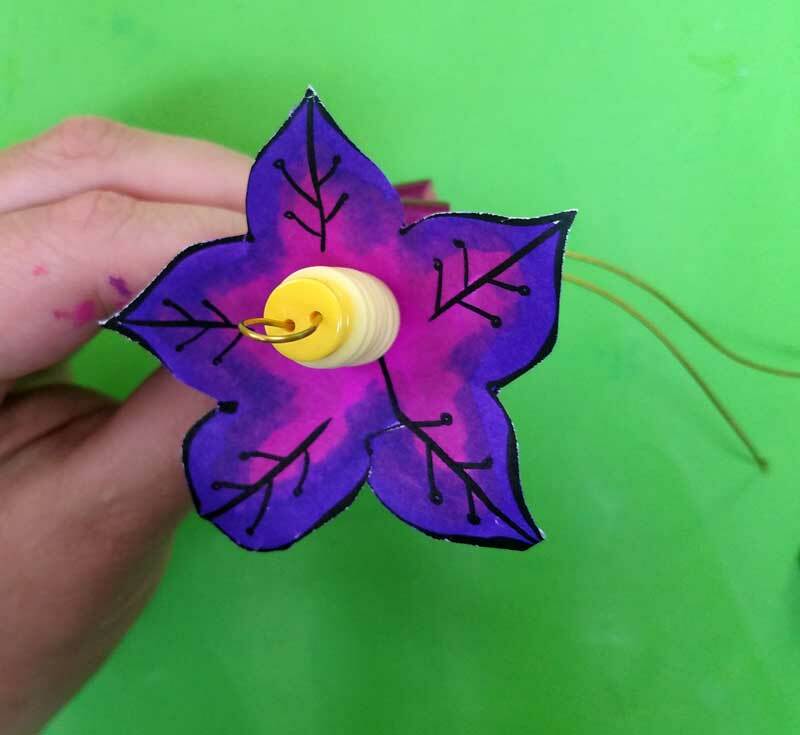 This is how I intended the paper flower templates to be used – two layered on top of each other, with a stacked button center. On this one, I varied the sizes of the buttons, and I twisted a leaf into the wire too (which was then covered with floral tape). 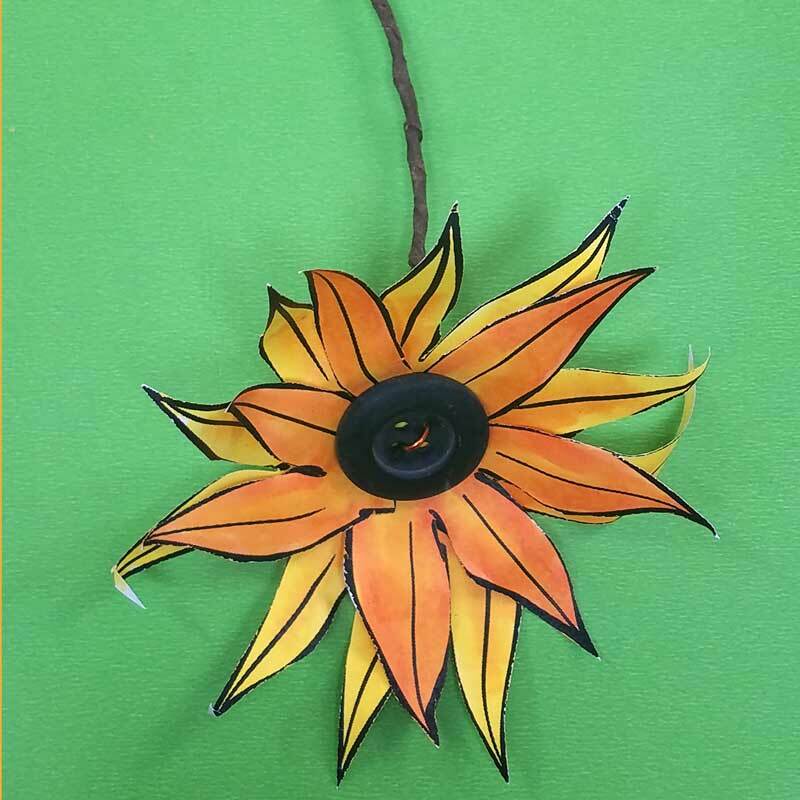 Here, I turned the paper flower templates with the long, narrow petals into a sunflower by adding a single large black button in the center. 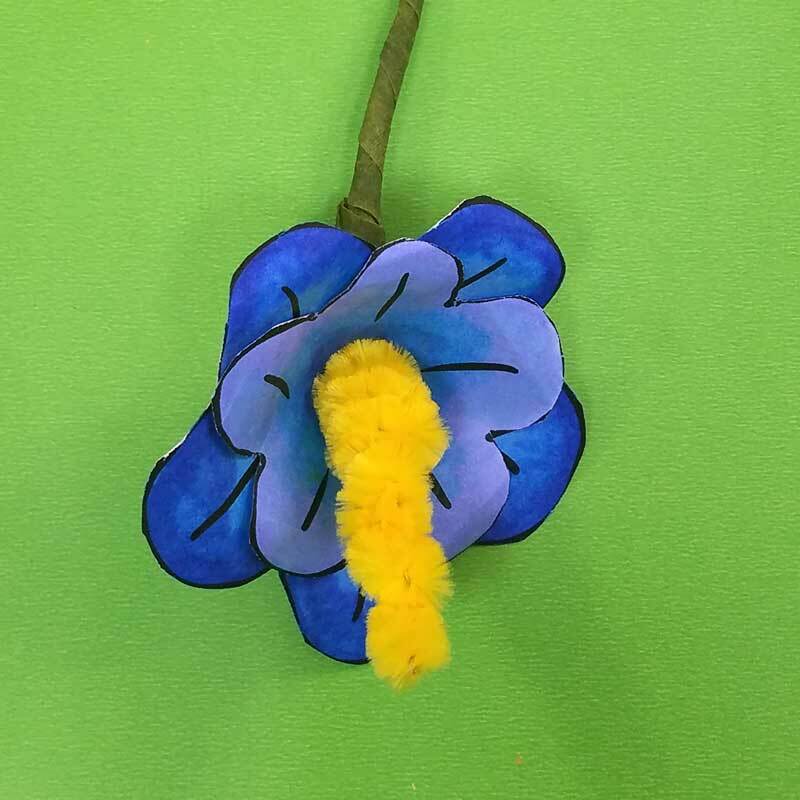 And here I gave it a totally new twist, but shaping an extra fuzzy pipe cleaner into the center and sticking that through the paper flower templates. 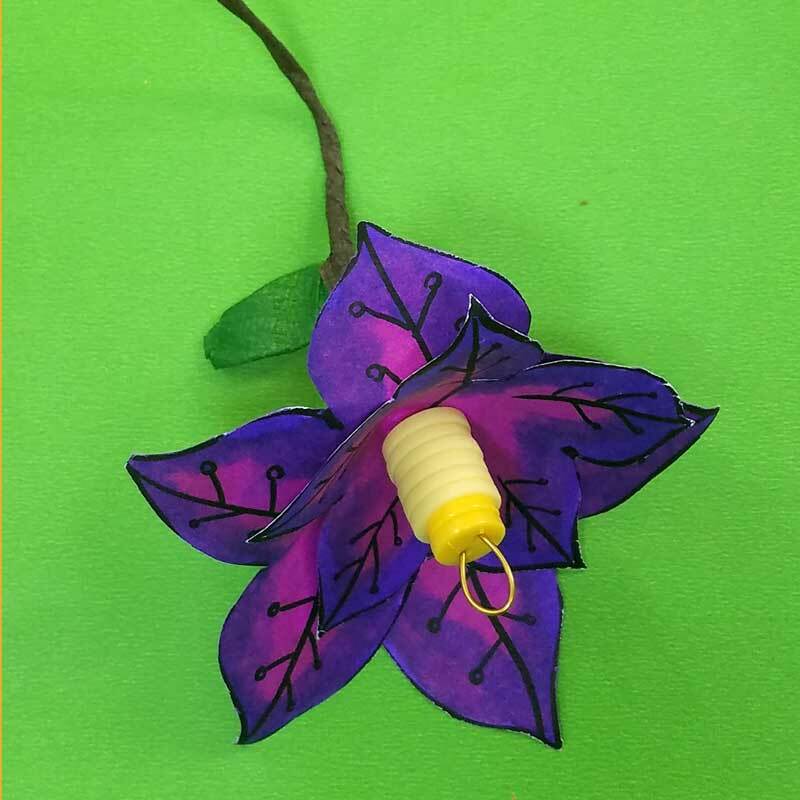 I attached it to the wire on the bottom of the flower. 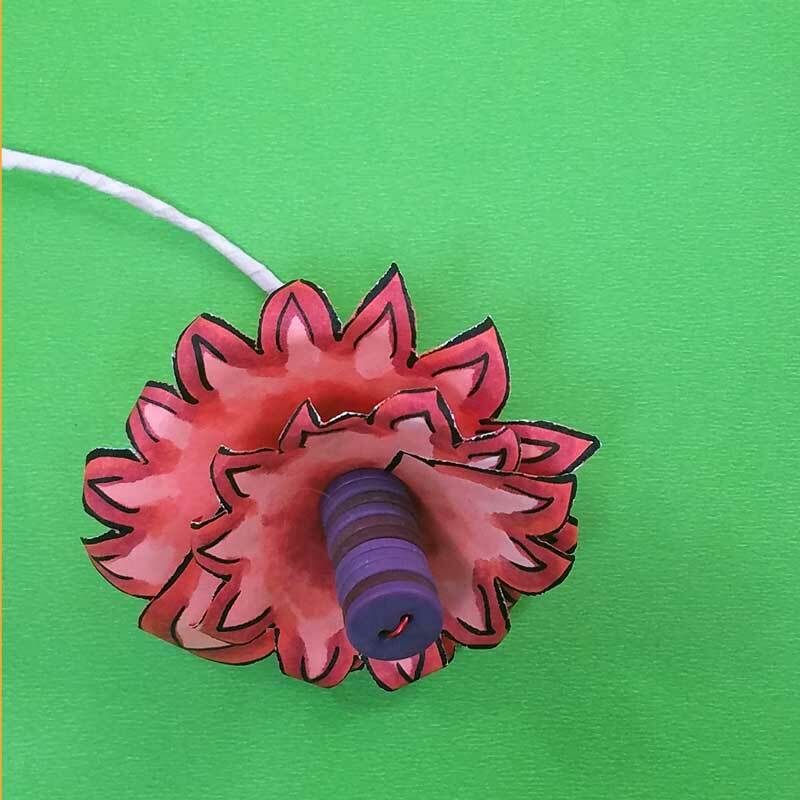 Both the buttons AND the pipe cleaner above serve to hold the paper flowers in place so that it doesn’t slide down the wire. 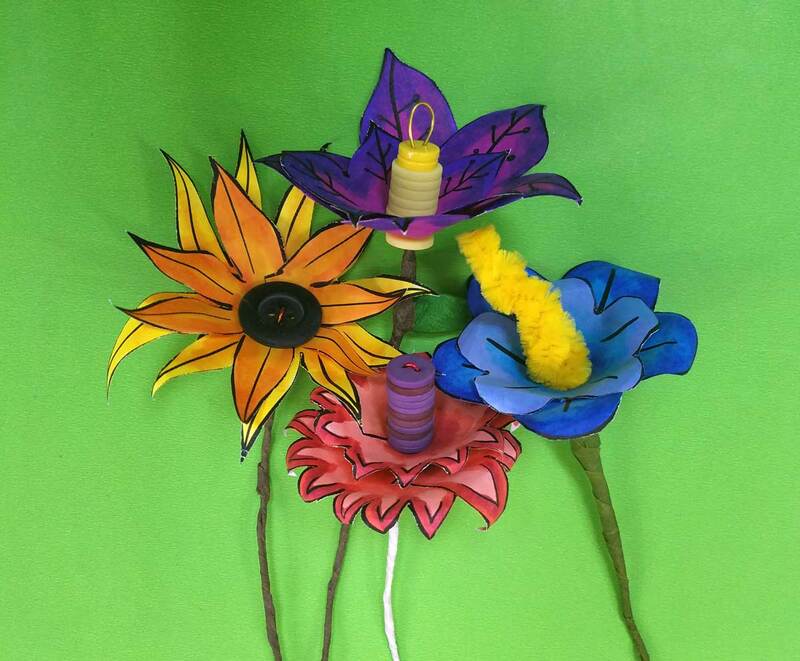 As you can see, these paper flower templates give you so many possibilities and will really ignite your creativity! 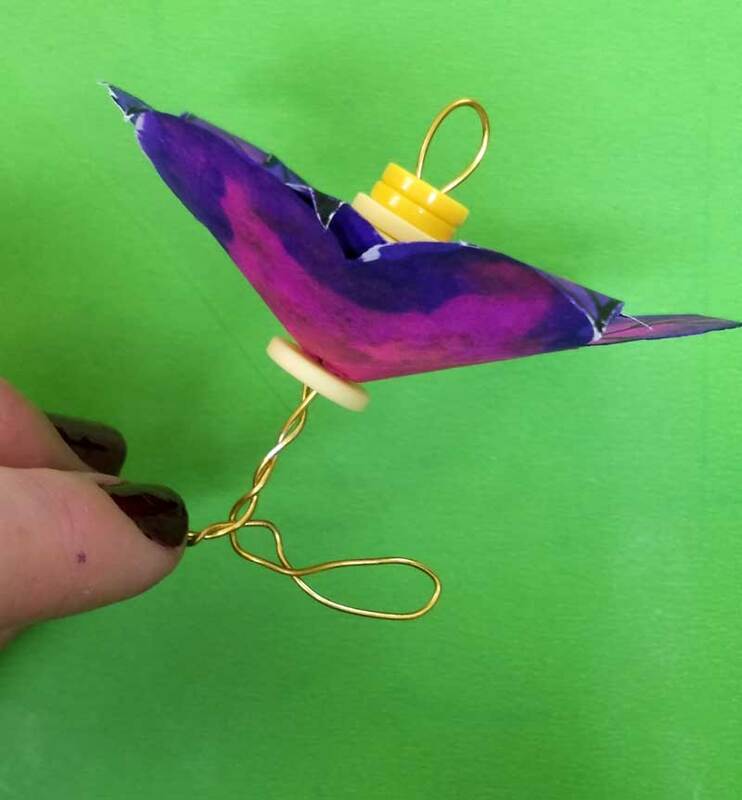 It’s something that can be crafted together with multiple age groups, and is a fun open-ended paper craft. Come join the Sisterhood of Crazy Crafters (a free crafting community) where you can share your own creations too! The template. Download it by entering your email in the form below. Check your inbox for your personal download link. You will be subscribed for relevant updates – unsubscribe at any time. Print it on regular copy paper (I did not use card stock for this one). Subscribe to Download your free templates! 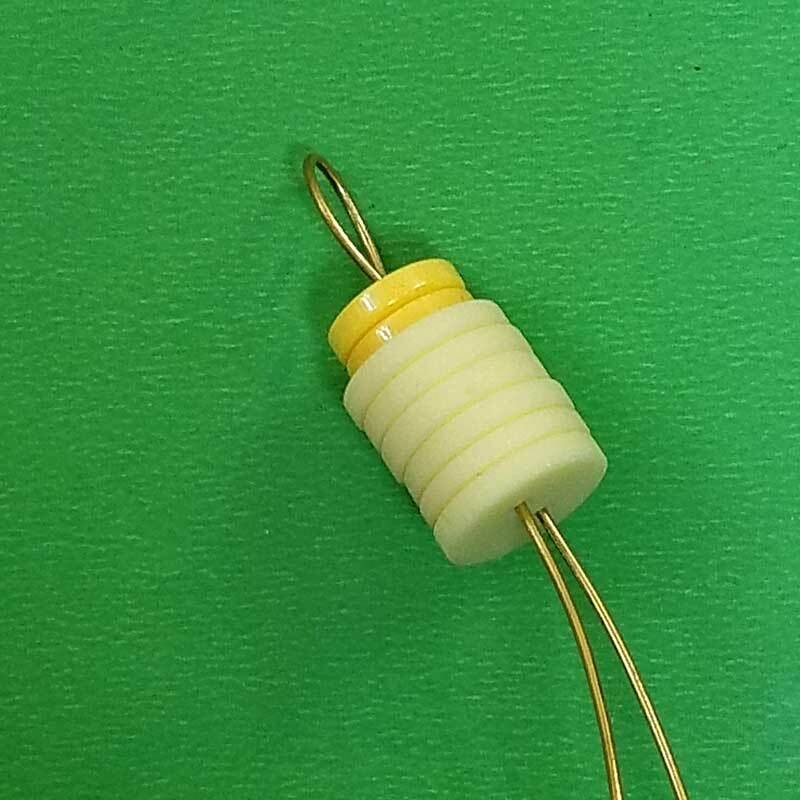 Wire thick enough to easily hold its shape – but thin enough to comfortably fit through button holes. I used 20 gauge. Watch the video below to see the tutorial in action! Or, scroll down for step-by-step detailed instructions. 1. 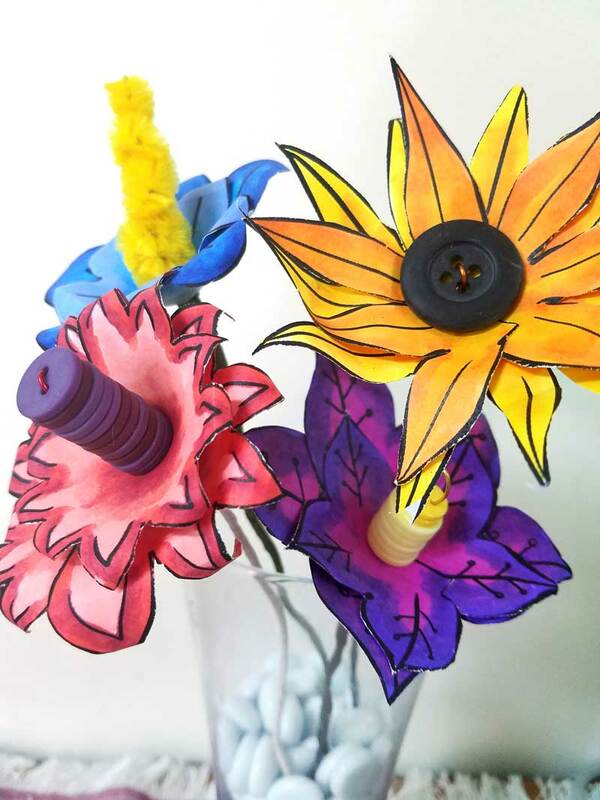 Print your paper flower templates. If you’re making scrapbook paper flowers, cut them out. 2. 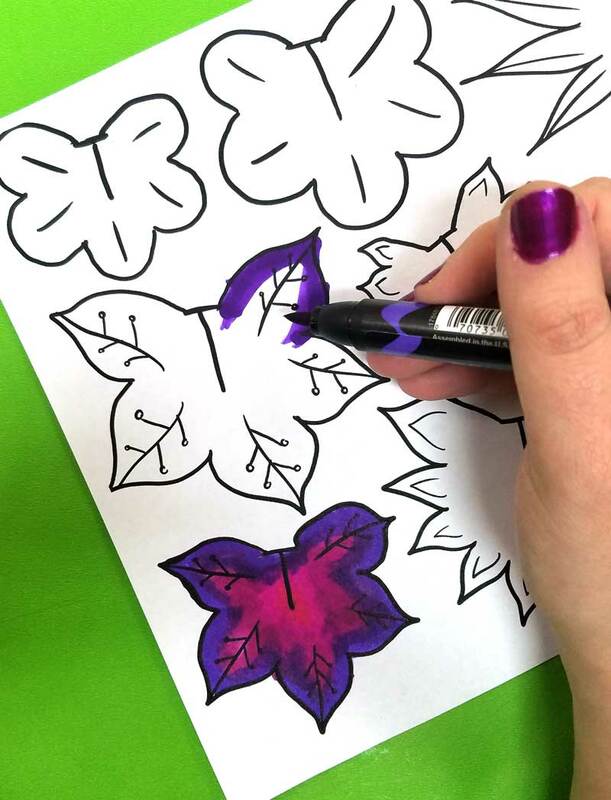 Color in your paper flower templates. 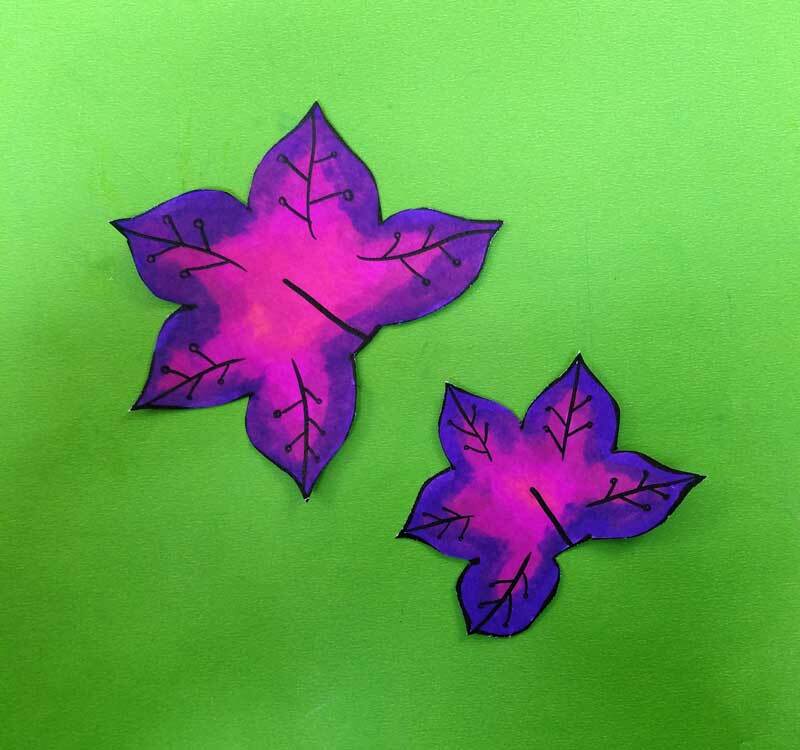 OR if you’re making scrapbook paper flowers, trace the cut out flowers from step 1 onto your paper. Make sure you also cut in the center. 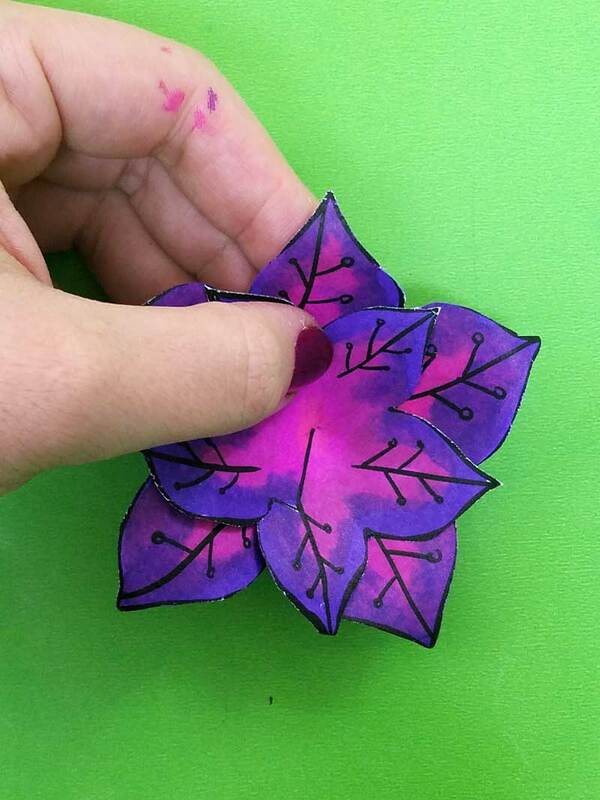 Note: the paper flower templates pictured in the tutorial is slightly different than what you got. As I was creating it for this tutorial I decided to tweak it a bit and make the slit in the center slightly smaller so that it’s more symmetrical all around. You can tweak this as you’d like. 4. Roll the edges around the end of a pencil to add a bit of character (optional). 5. 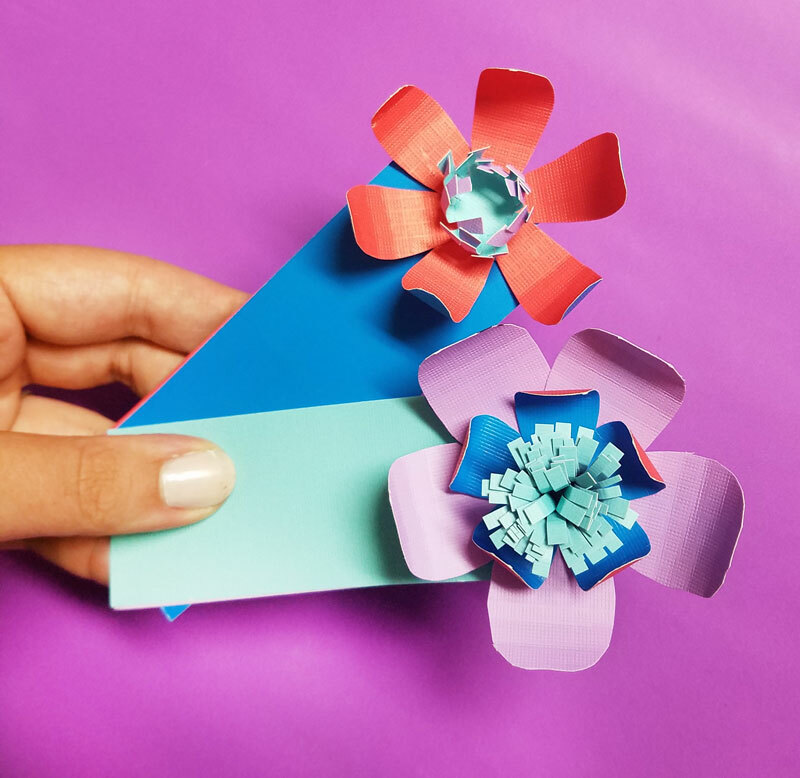 Form a slight cone with your paper flower templates. Make one side of the slit overlap the other so that the petals on either side are roughly the same distance apart s all the other petals. Tape in place. 6. Cut a piece of wire slightly more than double the length you want your stem to be. 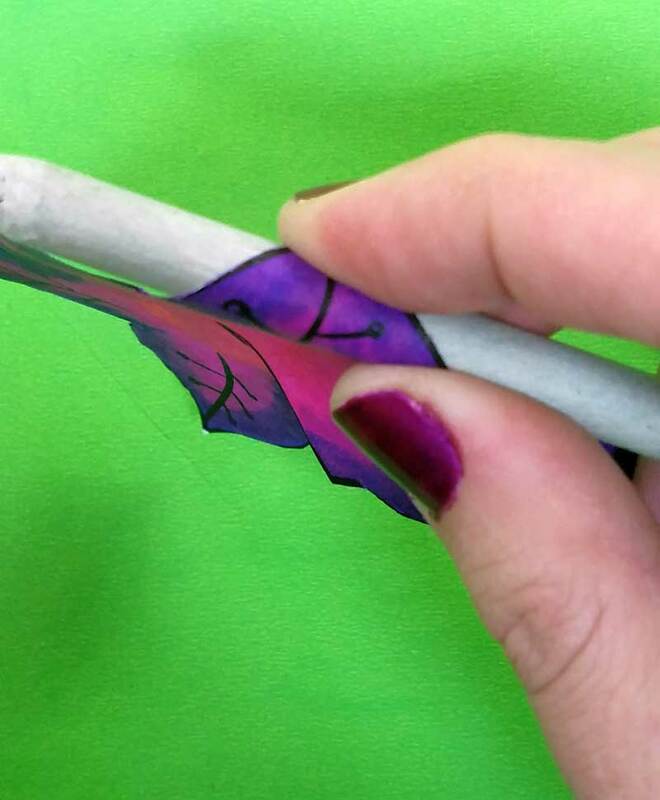 Fold in half without creasing the fold – let it just arch naturally. Thread each side through a buttonhole. Stack and arrange your buttons as desired. 7. 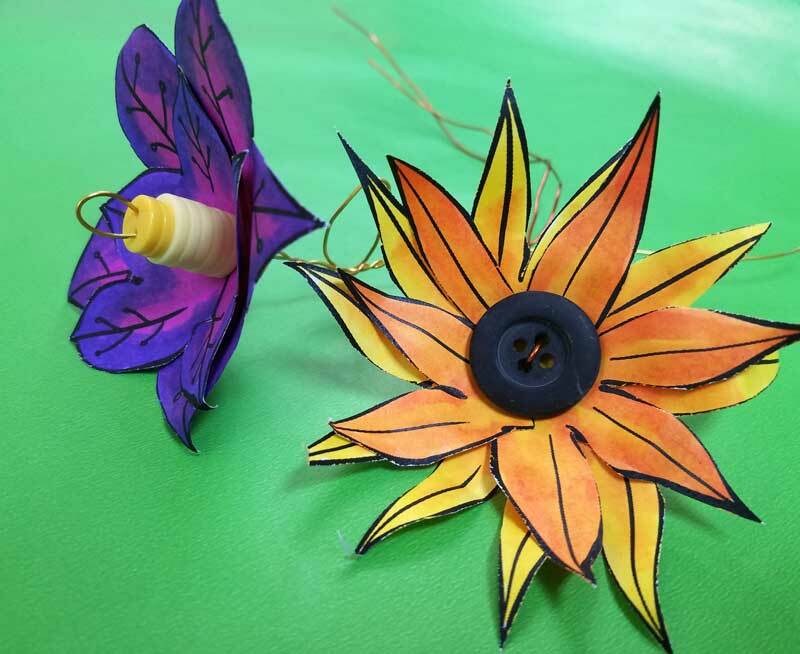 Gently poke your wire ends through each of your paper flower templates. If you want to add some more dimension, place a button between the two layers. I didn’t need any extra help with poking the holes, but if you’re struggling, try using a sharp edge, such as a needle. 8. 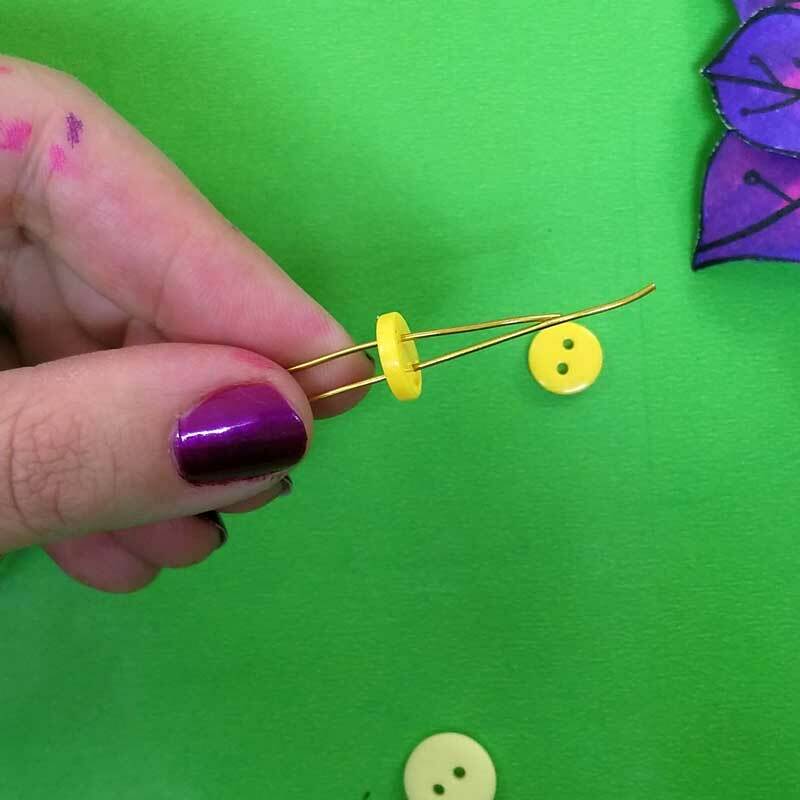 Thread on another button below your flowers. Twist the wire a bit so that it all stays in place. 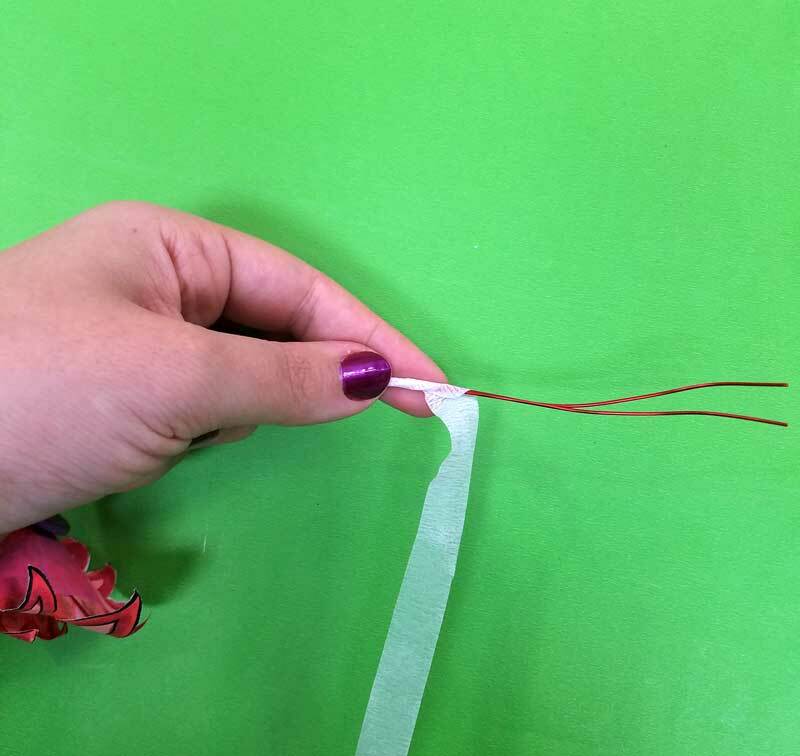 If you want to add an extra touch, twist a leaf shape into the wire. 9. 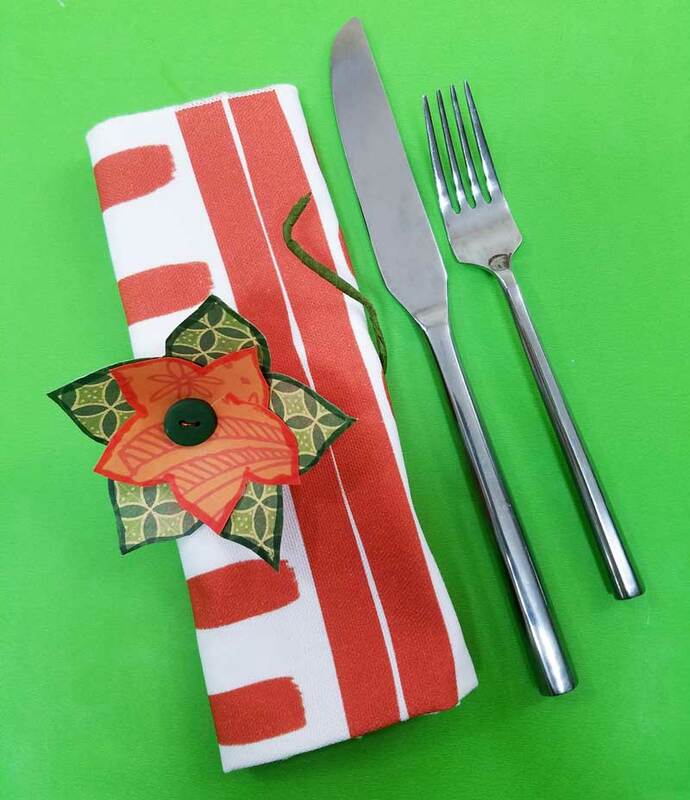 Starting from right below your flower, start adding florist tape. Twist it a few times to hold it in place, then start twisting it around the wire, spiraling downward, overlapping the previous layer. Finish off by twisting it a few times around the bottom. Your paper flower templates are ready for you to enjoy or to gift! 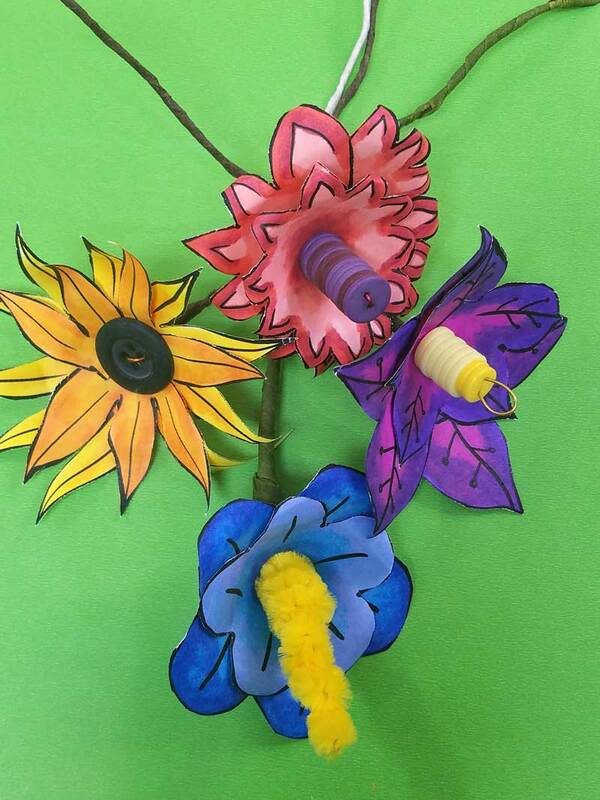 What will you be doing with these paper flower templates? Comment below and share your own variations! 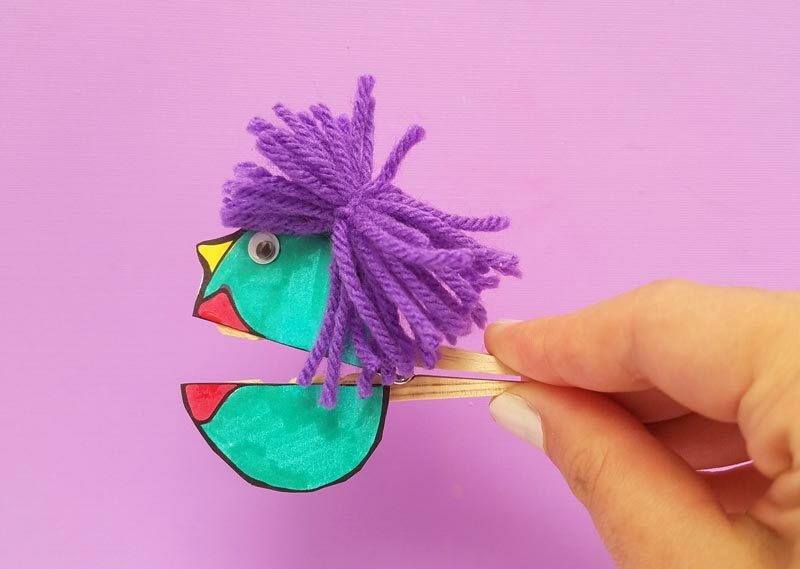 You can share it here too with a fun community of crafters like you! 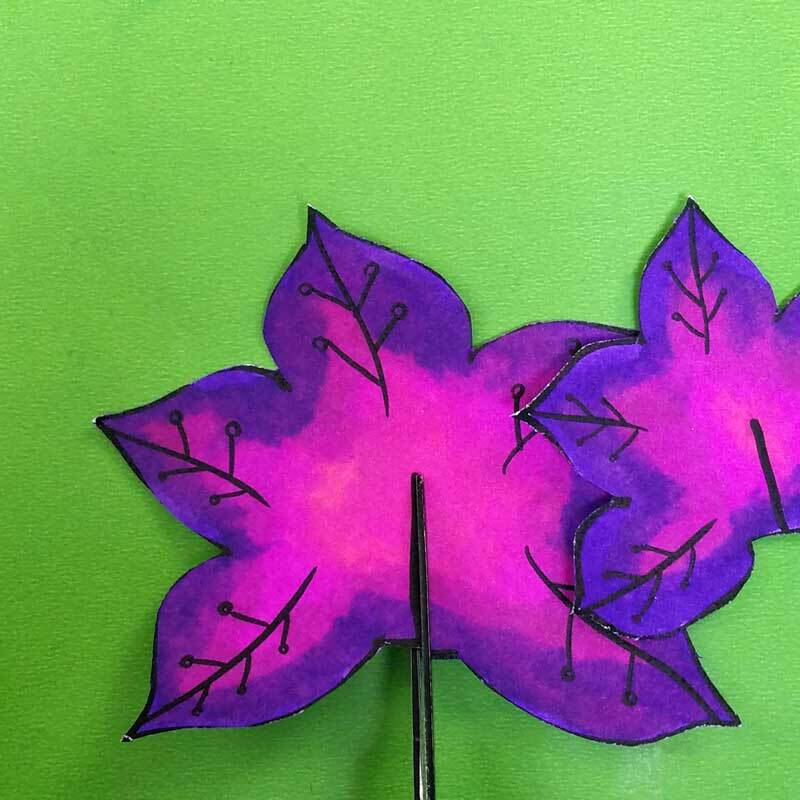 Want more posts like these paper flower templates? Click on the image to be taken to the tutorial! Adult Coloring, Crafts for Adults, Crafts for moms, Crafts for Teens, Crafts for tweens, Free Printables, Holiday and Seasonal crafts, Paper Crafts, Spring crafts, Tweens/Teens. Bookmark.